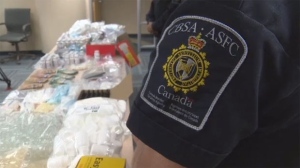 The Canada Border Services Agency has made a major seizure of steroids in Halifax. Border officials say the agency seized more than $250,000 worth of steroids and a Halifax man is facing charges in connection with the bust. Greg Doucette, 37, is facing charges of possessing, smuggling, importing and trafficking steroids. He was arrested Aug. 24 in connection with the bust. Albert Price, manager of the agency's criminal investigations division for the Atlantic region, says the steroids were sent through the mail. They were intercepted by officers in Vancouver at the agency's mail centre and were found in various mail packages, such as small brown boxes and envelopes that were bound for a number of addresses in the Halifax Regional Municipality. Price says the drugs came from several Asian countries and were being distributed throughout the Atlantic provinces. Border agents searched a home, a vehicle and a storage locker belonging to the accused. They also seized $25,000 in cash. Price says he doesn’t anticipate additional charges to be laid in the case.